The Wood Duck is often called Wisconsin’s most beautiful duck with its bright, multi-colored feathers. Wood Ducks can be found in bottomland hardwood forests, ponds, creeks, marshes and swamps. Wood ducks nest in tree cavities that they line with their soft, white downy feathers where they lay between 12 to 15 eggs. Soon after hatching, the young actually jump from the tree cavity when the female calls “weep, weep, weep,” and they all trek to the water together. Scarcity or availability of suitable nesting cavities can limit wood duck nesting even when most of the other habitat is present. Competition for the cavities from other animals (starlings, opossums, raccoons, owls, and other waterfowl) may reduce the number of them available for wood duck nesting. This also makes the wood ducks more vulnerable to predators. 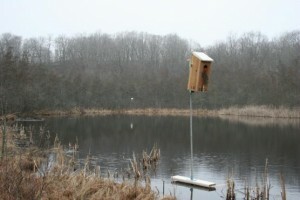 Nest boxes have become a common sight in wetland areas to help the wood ducks find safe nesting places. They provide more protection from predators and studies have shown that the ducklings have a 75% better chance of survival if the boxes are mounted over water. Daniel Boone Conservation League has over 300 acres of land. 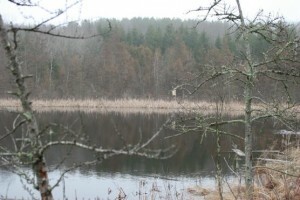 The property is set on glacial terrain that is the perfect habitat for wood ducks and other wildlife. 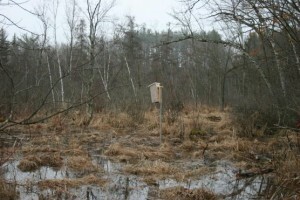 In 2006, a project was started to install and maintain nest boxes on the DBCL property. The nest boxes are cleaned and the bedding is changed every year and an estimated hatch count is kept. The nest boxes have produced very well over the past years. DBCL Wood Duck Nest Box Yearly Results. DBCL Wood Duck Nest Box Project 2013 results. If you have any questions about the DBCL wood duck nest box project please contact Steve Seibert.